Relative Layout is a layout which arranges views/widgets/viewGroups according to the position of other views/widgets/viewGroups i.e the new views are placed relative to the already existing views. For example in a class, if a Student A is sitting on a chair and the teacher of the class asks Student B to sit to the right of the Student A. Student B will know where he/she has to sit. Similarly, the position of each view can be specified relative to its sibling elements (such as to the left-of or below another view) or in terms of position relative to the parent. 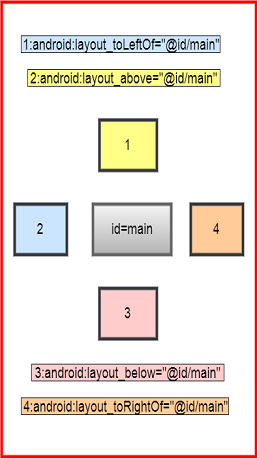 RelativeLayout is the most commonly used layout in GUI designing. To know how a RelativeLayout works, lets see and understand the most common attributes of RelativeLayout. Before we learn about the different attributes, we want to specify that the parent in our example is also a Relative Layout with height and width set as match_parent, therefore it will cover the whole screen of mobile. So the complete screen is our parent view. 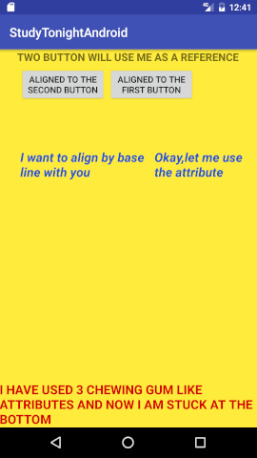 These type of attributes make the view act like a chewing gum as it can be fixed to any side of the parent view using these attributes. Again, for the example, we are considering our parent view to be a RelativeLayout with height and width set as match_parent, therefore it will cover the whole screen of mobile. So the complete screen is our parent view. If you write this attribute for a View, then that view will stick to the top of its parent. Since the parent covers the whole screen of mobile therefore, the view will appear sticking to the top-left of the mobile screen. If you write this attribute for a View, then that view will stick to the bottom of its parent. Since the our parent covers the whole screen of mobile therefore, the view will appear sticking to the bottom of the mobile screen. If you write this attribute for a View, then that view will stick to the left of its parent. Since the parent in our example covers the whole screen of mobile therefore, the view will appear sticking to the left of the mobile screen. If you write this attribute for a View, then that view will stick to the right of its parent. Note: You can always use more than one of these attributes. Suppose you use android:layout_alignParentLeft="true" and android:layout_alignParentBottom="true", then the view will stick to the bottom-left corner of the screen, as shown in the pink color view in the above figure. In a RelativeLayout you can keep(position) the new views relative to other existing views. Following attributes can be used for doing so. This tells the new view that you have to be on the left side of the view whose id is main. This tells the new view that you have to be on the right side of the view whose id is main. This tells the new view that you have to be above the view whose id is main. This tells the new view that you have to be below the view whose id is main. Note: When you assign an id to the View, you write android:id="@+id/main" i.e you write a + sign after the @ symbol, indicating you are assigning an id to that view. But when you use that id for other purpose, like above, you are adding a new view relative to an existing view having the specfied value of id, hence we do not have to mention the + sign. 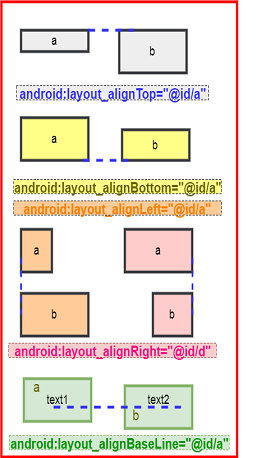 We simply refer it as android:layout_below="@id/main" i.e without the + sign. If you want to align the new view relative to any existing view, then you can use the following attributes. This aligns the top margin of the new view with the top margin of the view having id as a. This aligns the bottom margin of the new view with the bottom margin of the view having id as a. This aligns the left margin of the new view with the left margin of the view having id as a. This aligns the right margin of the new view with the right margin of the view having id as a. This aligns the text1 of the new view with the text2 of the view having id as a. We have placed one view with the id textView at the top of the screen using android:layout_alignParentTop="true" attribute. The 2 buttons are placed below the TextView having id textView. 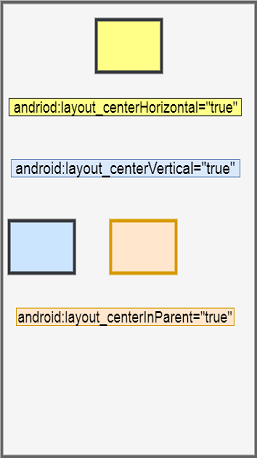 This is done by using the android:layout_below="@+id/textView" attribute in both the Button tags. 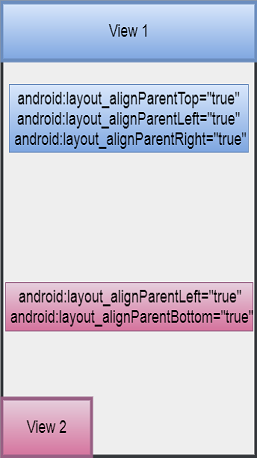 We have aligned both the buttons from the top margin (of each other), using android:layout_alignTop="@id/button" attribute. We also tried to align the two TextViews based on their text i.e aligning the texts of both the views. Last but not the least, we have used the sticky attributes, android:layout_alignParentBottom="true", android:layout_alignParentRight="true" and android:layout_alignParentLeft="true" to stick the textView4 at the bottom of the screen. Just like chewing gum being stretchable, the Textview in this example also stretches so that its boundary gets stretched and sticks to the left, right and the bottom the screen.